Spacious Central One Bedroom Apartment With Private Sun Terrace & Stunning Pool. “Mint” is a spacious first floor one bedroom apartment located close to the town centre on the popular Han Inn complex. This attractive site of just 9 apartments has a stunning 185m2 shared pool set amongst mature gardens. The apartments are set away from the bustle of the town yet just two minutes walk to the shops, banks and cafes/restaurants. An ideal location which many nick name the "Secret Garden". “Mint” has its own private entrance from Melodi street via an attractive wooden walkway and very few steps. The small entrance hall leads to a spacious open plan living area with large French doors onto the sun terrace. The lounge also features fold up French doors to a Juliet balcony that overlooks the pool and gardens. The apartment benefits from a 30m2 first floor private sun terrace surrounded by jasmine, begonvilleas and jacaranda trees. From the sun terrrace there are pool, garden and mountain views. The double bedroom is again spacious with French doors to a Juliet balcony overlooking the pool. A lovely feature of this room is the wooden ball footed king size bed (160x200cm) which our guests comment as being very comfy. Adjacent to the double bedroom is a large bathroom with walk in shower. The private sun terrace has two new modern sun beds, a marble topped dining table and 4 chairs and two large umbrellas. Mint is a great couple’s apartment and an additional guest can be accommodated comfortably on the lounge double sofa bed if required. For guests sleeping on the sofa bed there is £50/week surcharge. For 2019 we will also have the poolside one bedroom below Mint available called Lime. If you dates for Mint are already sold or you wish to come as two small groups together then please contact me for more information. I am well known estate agent in Kalkan and I just love everything property related. In moved to Kalkan from the UK in 2001 when I married my husband Sakir. We run the business together with our nephew and neice. We purchased our Terrace apartment (TK4041) on this complex back in 2014 and we just love the "Han Inn" site. It is totally unique and so conveniently located for the town. The architecture is based on a Mediterranean Village with a pretty 185m2 communal pool and lush gardens. When this property also came up for sale we just had to go for it. The convenient location, large communal pool which is never overly busy, the spacious room sizes and that private sun terrace. Both the bedroom and lounge have split air conditioning units. Bed linens, bathroom towels and pool towels are provided. Inside it laid out for 2 people but an additional chair can be provided for 3 occupancy. A baby high chair can also be supplied if needed. The apartment has its own first floor 30m2 private balcony terrace with two private sunbeds, umbrella, dining table and chairs for 4. Just in case you want to invite a neighbour round for drinks. Most likely the largest private pool in Kalkan with 185m2 area. Only 9 one and two bedroom apartments share this and not all are rental properties. It is never crowded or too busy. The apartment was fantastic in every respect...a few minutes walk to the heart of the town and harbour yet tucked away in a beautiful private garden setting. Bridget was very attentive, and great care was put into making us feel welcome. We shall definitely be returning...5 stars from me!!!!! This was not our first time in Kalkan but first time in Mint. The location of this flat is ideal for shopping and eating out especially if going to the old town. The flat is spacious and overlooks the pool which is a few steps down from the flat. The pool is set in mature gardens. You have everything you need to self cater and we cooked at home a couple of times getting fresh veg from the market. We are hoping to return to this gem of an apartment next year. Sandi F.I was born in Surrey but have lived in Lancashire since the early 1980s. The reality of this location and apartment was way beyond our expectations! A true oasis in the town just moments away from the old town and the marina with bars, restaurants , supermarkets, pharmacy and doctor's office, banks etc just steps away. If you hire a car you can park right outside the gated entrance to the apartment or the taxi rank is just a few metres away. It is a small complex with beautiful gardens surrounding an excellent swimming pool and plenty of quality sunbeds on the surrounding terrace. The apartment itself is very attractive: Spacious, light and airy and spotlessly clean. From the bedroom there is a French door overlooking the pool and gardens and in the lounge there are two sets of double French doors, again over looking the pool and gardens and one set leading onto the huge private sun terrace which is bordered by beautiful mature plants such as honeysuckle, jasmine and bougainvilea. 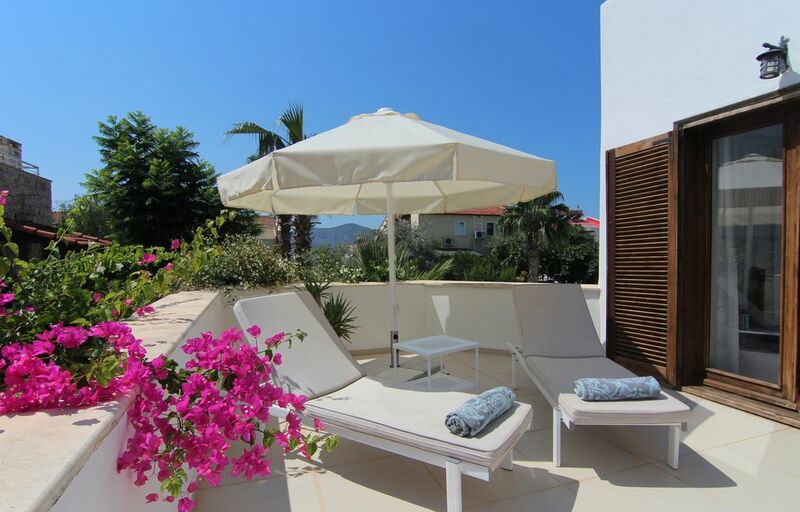 Newly furnished with quality dining table and chairs; two excellent sunbeds and two large parasols, this is an outstanding feature of the apartment. Everything you could possibly want is in the apartment for full catering if you wish including a large fridge freezer, cooker, microwave and washing machine; toaster, kettle and so on. Towels are provided for the bathroom, for the beach/swimming pool and even hamam towels for sunbathing. In the spacious bathroom there is an excellent rain shower. Washing powder for the washing machine is even provided. Hairdryer and electrical extension leads are also provided and there is more than enough wardrobe and drawer space in the fully furnished bedroom. (Plenty of coat hangers too!). Free wifi is excellent; the only slow process was uploading photographs from my phone but hey, you are on holiday, so you have plenty of time to spare in gorgeous surroundings. There is a flat screen TV, DVD etc. Cable and satellite TV is installed but you can't get English TV channels other than BBC World Service and BBC Premium which does screen English programmes. We have just returned from a week at the Mint Apartment in Kalkan and it was amazing! It really is an oasis in the centre of town, just on the edge of the old town and marina with bars, restaurants, supermarkets, fresh fruit and vegetables, pharmacy - everything you need just steps away! Once back in the small complex, it is quiet, offering beautiful manicured gardens and a gorgeous pool with many comfortable sunbeds. The apartment is fabulous - everything you could possibly want is provided including towels for the shower, towels for the pool/beach, hamam towels for sunbathing, washing machine including washing powder, washing-up liquid, tea towel, washing up sponge and so, so on. There is free unlimited wi-fi which was very good; flat screen TV with satellite and cable channels (not English TV as such but BBC Premium and BBC World Service. DVD player. Kitchen is fully equipped and the entire apartment is super-clean, airy and light. In the bedroom there are French doors overlooking the pool and gardens and in the lounge there are two double French doors, also overlooking the pool and gardens and one set opening on to the large sun terrace furnished with outdoor dining furniture and two comfortable, quality sunbeds. The terrace is adorned with bougainvilea, plenty of scented jasmine and other plants. The garden not only feels like an oasis but also looks like one. It's just such a lovely place to be and although so central, if you hire a car you can park right outside the gated entrance to your apartment! This was probably the best all round apartment we have ever rented and, believe me, we are in our sixties now and have certainly rented more than I can remember! Bridget, the property owner, is lovely. The communucation when we booked and up to our arrival was excellent and she provided an information pack which covered just about everything! We emailed her a couple of times over getting some water and something else very minor and our wish was granted within minutes! Go ahead and book this lovey apartment - I promise you will not regret it. I am really pleased you had a great stay. Thank you for the thoughtful and detailed review. I am glad you love the apartment the small complex it is in as much as I do. Great apartment, in a fantastic location . It’s a beautiful oasis in center of Kalkan. Apartment is lovely, very clean. Thanks Andrew I am glad you enjoyed your stay. Thoroughly enjoyed our visit at Mint apartment , very clean and welcoming on arrival. The apparentent is in an excellent location and would definitely recommend to family and friends. Price are based on 2 occupancy in one bedroom. If the sofa bed is required for a third guest there will be an additional £50/week charged. Flexible changeover days subject to our confirmation.